1. A Mu mu that my mother actually made for my sisters and myself. The image is so small, but it had a square yoke and she made them with contrasting neck and sleeve bands. 2. A quilted bathrobe that was made of a satiny material, and it had a very similar fabric design as shown on the pattern envelope. 3. 70s pants suite! Mine was very similar, in a light summery tan plaid fabric. 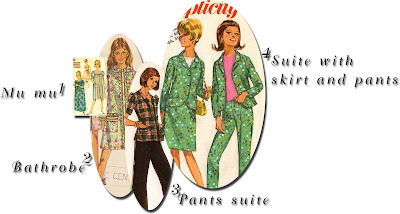 Both the jacket and pants were the same and the jacket had similar short, puffy sleeves. 4. My suite with a skirt and pants was exactly like this one, but in a purple, fuchsia color with small yellow flowers. That was very popular in 1966, everything was in small flowered prints and you wore it with a knitted tee shirt, which was a called a Poorboy. This is especially memorable as I wore on a trip to Europe with my parents.